The success of the Mars Curiosity rover continues. 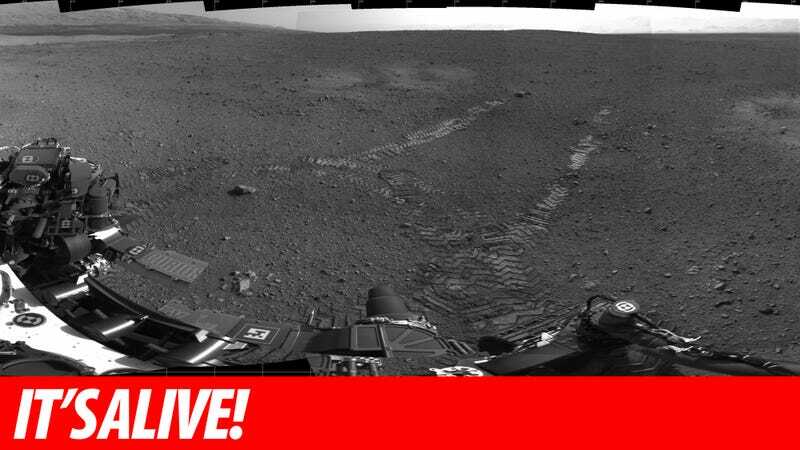 As this image just released buy NASA's Jet Propulsion Laboratory shows, Curiosity is now moving without any problem whatsoever. You can clearly see the tracks in this part of a new 360-degree panorama. The rover started to move on August 22, according to the mission drivers. Its first move was "going forward about 15 feet (4.5 meters), rotating 120 degrees and then reversing about 8 feet (2.5 meters)." Now, "Curiosity is about 20 feet (6 meters) from its landing site", now named Bradbury Landing. The site was named after Ray Bradbury, the author the Martian Chronicles, a short story collection that told the story of Mars colonization written in 1950. You can also clearly see the marks left by the rockets of the sky crane that dropped Curiosity over Mars' surface.